Capture ratios serve this purpose. They measure relative performance versus the market (or any other relevant benchmark) in periods when the benchmark is rising - the upside capture ratio (“UCR”), and in periods when the benchmark is falling - the downside capture ratio (“DCR”). Logically, a higher UCR and lower DCR are considered more attractive. However, an investment doesn’t necessarily require a very high UCR or very low DCR to exhibit strong performance characteristics. More important is that the UCR is higher than the DCR, and exhibits a wide and positive spread between the two. A good rule of thumb is to look for a positive UCR-DCR spread of at least 20-30%. For example, an investment with a UCR of 90% and DCR of 65% would result in a positive UCR-DCR spread of 25%, which may be considered attractive. Like many other performance metrics, a capture ratio is specific to a time period, so there may be different results over a 1 year, 3 year, 5 year, or 10 year time horizon. A longer time period is likely more relevant, so long as there are no extenuating circumstances within that time period, such as a significant change in a mutual fund’s investment strategy or manager style. A very important factor with capture ratios is the benchmark, because the benchmark directly affects the calculation of the ratio. If the benchmark is changed, the capture ratios will most likely change as well. Broad market indices are often used, such as the S&P/TSX Composite or Canadian stocks, S&P 500 for U.S. stocks, or FTSE TMX Canada Universe Bond Index for Canadian bonds. Non-index benchmarks can also be used, and in some cases may be more relevant. For example, managed assets such as exchange traded funds, open ended mutual funds, and segregated funds entail a management fee (and insurance fee for the latter). Therefore, using a benchmark that also accounts for the reality of investment product fees - such as a fund’s category average1 - may result in a more relevant outcome. An Individual investment may also be used as the benchmark, particularly when directly comparing one investment with another. Whether using a market index, category average, or individual investment as the benchmark, it is imperative that the benchmark be relevant. Inappropriate examples would include using a bond index as the benchmark to assess a stock, or a Canadian equity fund category average for a global balanced fund. In assessing the relevance of the benchmark, at least one of the DCR or UCR should be between 75% and 125%. For example, an UCR of 78% and DCR of 50% may indicate an appropriate benchmark. If, however, the UCR is 50% and DCR is 20%, it is likely the benchmark is too aggressive and not appropriate. Similarly, an UCR of 160% and DCR of 135% likely signal an inappropriate benchmark that is too conservative. 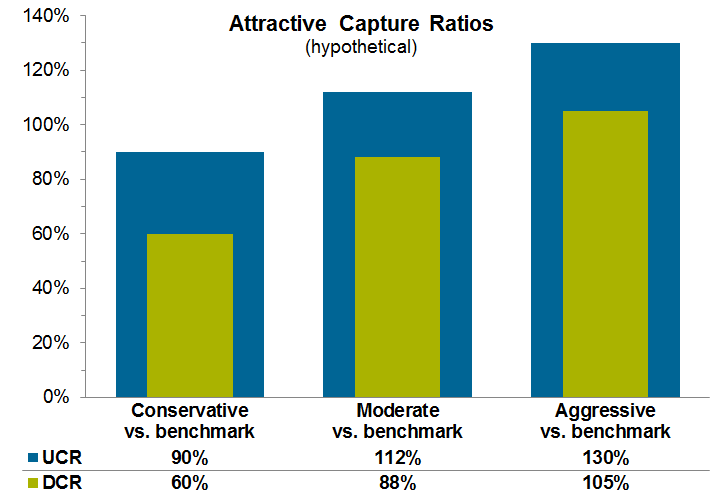 The following chart shows hypothetical capture ratios that may be considered desirable for conservative, moderate, and aggressive investors. All exhibit attractive UCR-DCR spreads (the distance between the top of the blue and green bars) and seem to indicate the usage of appropriate benchmarks. 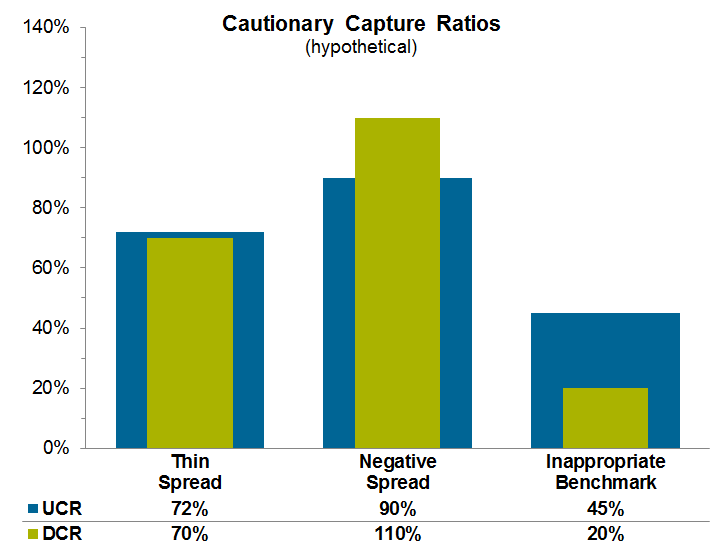 The next graph shows cautionary hypothetical capture ratios, either because of thin or negative UCR-DCR spreads, or because the results seems to indicate an inappropriate benchmark. ● A negative capture ratio is mathematically possible - a negative DCR means the investment has on average gained when the benchmark was down, and a negative UCR means the investment on average declined when the benchmark was up. A negative capture ratio is unusual and it likely means the time horizon is too short to be meaningful or the benchmark is not appropriate. ● A passive index fund should have a negative UCR-DCR spread - a passive index fund’s purpose is to exactly track the performance of its benchmark index before fees (a 100% UCR and UCR). However, after accounting for fees - no matter how small - the result is an UCR less than 100% and a DCR greater than 100%. ● If an investment turns in negative performance for a period when the benchmark is up, that will impact the investment’s UCR, not it’s DCR. Performance is divided into periods when the benchmark is up or down, not the investment. 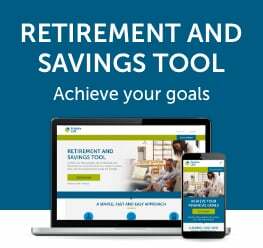 1 Most mutual and segregated funds in Canada are assigned to a category of similar funds by the Canadian Investment Funds Standards Committee (see CIFSC.org for more information). Based on these CIFSC categories, category averages are calculated by independent research firms such as Morningstar Research Inc.